This weekend I had a yellow cake bake-off. Since I don’t have a lot of people to help eat the cakes, I made 3 half batches using recipes from the Magnolia Cafe cookbook, a Carole Walter book, and Paula Deen. All 3 cakes were variations on the old 1-2-3-4 cake which calls for 1 cup butter, 2 cups sugar, 3 cups flour, 4 eggs, 4 teaspoons baking powder, 1 cup milk and about 1 teaspoon of vanilla. It’s a recipe which tastes different depending on technique, type of flour, and method of measurement. Since I only posted pictures and descriptions of the first two cakes, I’ll go ahead and tell you a little more about the Paula Deen cake (pictured below). It was similar to the other two, but instead of using half self-rising and half all purpose or sifted cake flour, Paula used 3 cups sifted self-rising flour. The cake tasted delicious and of the three, it was the most convenient. However, the texture was a little coarser and looser crumbed than both of the others. So that’s it for 1-2-3-4 cake variations. I’m enjoying these yellow cake trials and I think I’ll move on to some yellow cakes that are highly rated, but which use different proportions (e.g Shirley Corriher’s, CI’s, and Bonnie Butter Cake by Betty Crocker). I love that you took the time to compare these. Very interesting. J, one of the cakes I wanted to test had whipping cream as the main fat. But I took it off my list (for now) because I want to keep the butter flavor. Shirley Corriher’s cake has a little of both. What do you think of whipping cream cake? I have never done a side by side comparison of a typical yellow cake versus whipping cream cake (super easy to make since you do not have to cream the butter and sugar). Danielle and Rina, thanks for the two new additions to the list. I’ll see if I can get to them after I try Shirley’s, CI’s and Betty Crocker’s. CB, now worries! I figured you were just reading fast. Glad you like the pictures. I think the next set of three photos will be better because I will make all the cakes in a 9 inch pan and cut all the pieces the same. Katrina, I’ll probably bake them on and off between other things. I baked a few other things this weekend between cakes and still need to post. Duh! now I see the CI snuck in there between Shirley and Betty! That’s what I get for reading w/o my glasses. I am anxious to see you results as I trust your opinions and like your pictures (helps you see the differences in appearance). I love your comparisons too! I use Shuna Fish Lydon’s ecipe as my go-to, but very curious to hear about the results of your next bake-off. Here is Shuna’s recipe in case you want to compare: http://eggbeater.typepad.com/shuna/2006/10/yellow_cake_wit.html. I was constantly searching for the ‘perfect’ yellow cake and tried many different recipes, however, none of them were as moist as I’d like until I made the yellow cake recipe from Amy’s Bread in NYC. This is now my go-to yellow cake, and I’ve ended my search. Rita, I love comparisons too. Alyssa, thanks for helping me find Shirley’s recipe. The next yellow cake bake-off is going to be Shirley C. vs. Cooks Illustrated vs. Betty Crocker. I enjoy your comparisons and your spreadsheets. 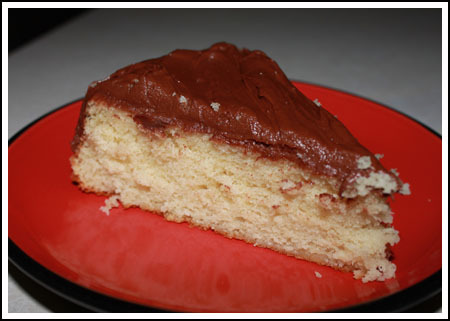 Have you ever tried the yellow cake from Cook’s Illustrated cookbook “The Best Recipes”? It is a great cake with a fine texture. It is interesting what a difference such small changes can make! Glad to be of help! I love Bakewise – and Magnolia and Paula — Girl, it looks like you had fun with your cake off – that is a lot of yellow cake! Yum! Isn’t that so interesting that all 3 recipes are so similar yet you can notice such diferences in cakes’ textures?! That’s why I just love pastry! I love the trhowdowns Anna, keep them up!! !